This category contains blog entries that discuss potential naked put trades using Troy’s proprietary Deep OTM NP Strategy. (1) 262 trades met our selection criteria, 6 of which I singled out as recommendations warranting your further review. (2) 27 trades (10.3%) finished ITM. One of the 27, RSH, was one of my 6 recommendations. This failure rate is higher than normal. In most months 5% or less of the selections finish ITM. (3) Premiums received, net of commissions, for the 262 trades was $36,175.10. Entering all of these trades would have required a capital commitment of $1,970,070.00. Net ROIC was 1.84% (23.94% annualized). (4) Capital losses significantly ate into the net premiums received. Losses from the 27 trades that finished ITM were $18,995.25. (5) Net profits thus totalled $17,176.85. This yields a ROIC of 0.87% (11.37% annualized). This is a little bit below our normal rate of return. Now I’d like to present a summary of our 2011 total results. (1) This year the selection criteria produced a total of 2220 possible trades. (2) 244 (10.99%) of the 2220 trades finished ITM. Thus, 89% of the trades were successful. (3) Net profits for 2011 totalled $165,899.95 using an average capital commitment of $1,437,182.92. This resulted in an annualized ROIC of 11.54%. (1) The strategy consumed a considerable amount of my time each weekend. (2) The results obtained by the strategy were not commiserate with the amount of time it took me to analyze and produce them. (3) The underlying stocks of the selected trades were not ones with which I was comfortable commiting my own money. I can not in good conscience continue to recommend trades for you that I’m not willing to commit my own money. However, I am developing a new strategy. This new strategy revolves around trading a select list of solid blue-chip, dividend-paying stocks. I will be rolling it out soon. Wishing all of my fellow traders the very best holiday season. MERRY CHRISTMAS! This week we have 8 possible trades which meet the week 1 selection criteria of our Deep OTM NP Strategy. They are listed below. When one digs a little deeper however, one sees there is no comparison. BBY is a better trade. Two facts led me to this conclusion. First, BBY trades at very reasonable 9.4x trailing earnings and 7.2x prospective earnings. ADBE trades at over 15x trailing earnings. Yahoo does not provide an estimate of prospective earnings. Second, BBY pays a regular and growing dividend. In the past 5 years the quarterly dividend has been increased from $0.10 to $0.16. These things are important to me because of the current market environment. I only want to trade in the very best underlying stocks that I can find. As you can see BBY has support at $24 which is just below our $25 strike price. This isn’t an ideal situation and if this trade had appeared in Week 3 or 4 of the DEC expiration month I probably would think long and hard before committing capital to it. However, it is Week 1. We have only 5 trading days to expiration. 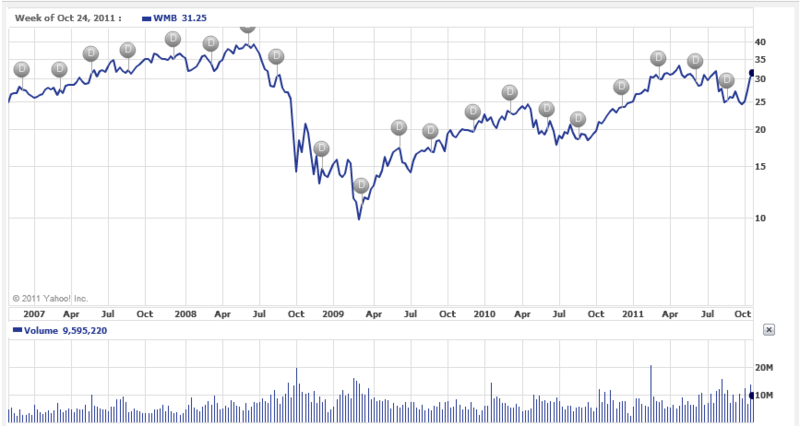 Another mitigating factor is that BBY is near its March 2009 lows. 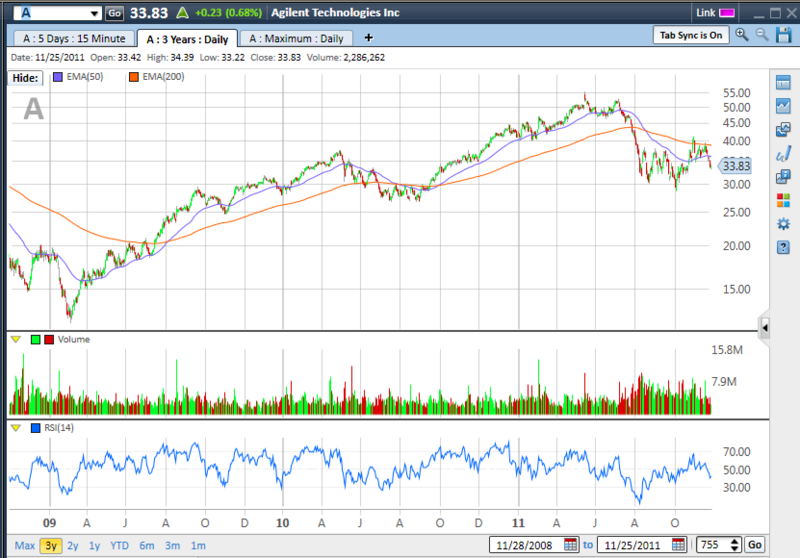 While it was significantly lower in November 2008 it quickly recovered. I would feel comfortable owning BBY at $25. Well, there you have it. Best of luck to everyone is this last week before expiration. Our Deep OTM NP Strategy selection criteria returned 12 possible trades this week. As you can see I have highlighted two that I think warrant further attention. 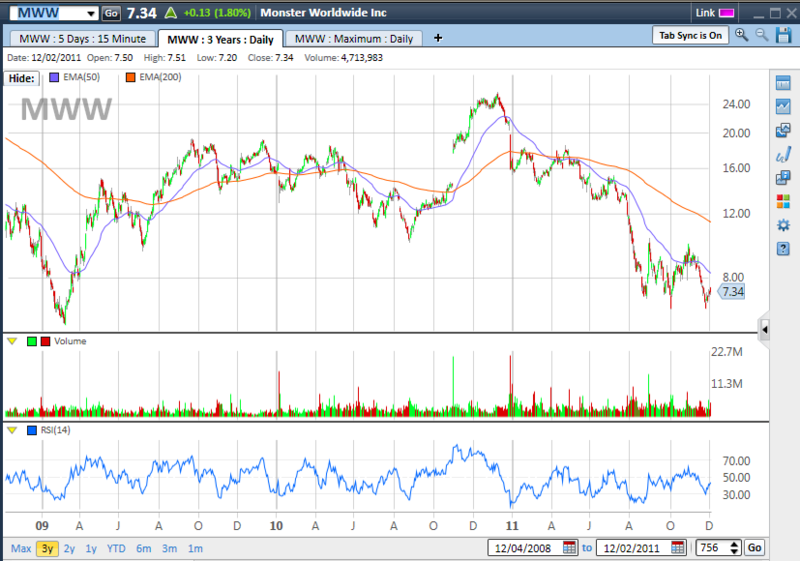 Let’s first take a look at Monster Worldwide (MWW). Monster Worldwide, Inc., together with its subsidiaries, provides online employment solutions worldwide. The company operates a network of Websites that connect employers and jobseekers. It was founded in 1967 and is based in New York, New York. MWW trades at 0.74x book value and 13.35x prospective earnings. It has positive cash net of total debt on its balance sheet and generates positive free cash flow. Friday, MWW closed at $7.34. The DEC put we’re interested in has a strike price of $6. This is below the 52-wk low of $6.34 which occured on October 4. With almost 19% DSP and an annualized ROIC in excess of 21% this trade appears to have a reasonable risk/return ratio. Next, let’s take a look at Arkansas’s Best (ABFS). Arkansas Best Corporation, through its subsidiaries, engages in motor carrier freight transportation in the United States. The company provides shipping services to its customers by transporting various large and small shipments to geographically dispersed destinations. It was founded in 1935 and is headquartered in Fort Smith, Arkansas. 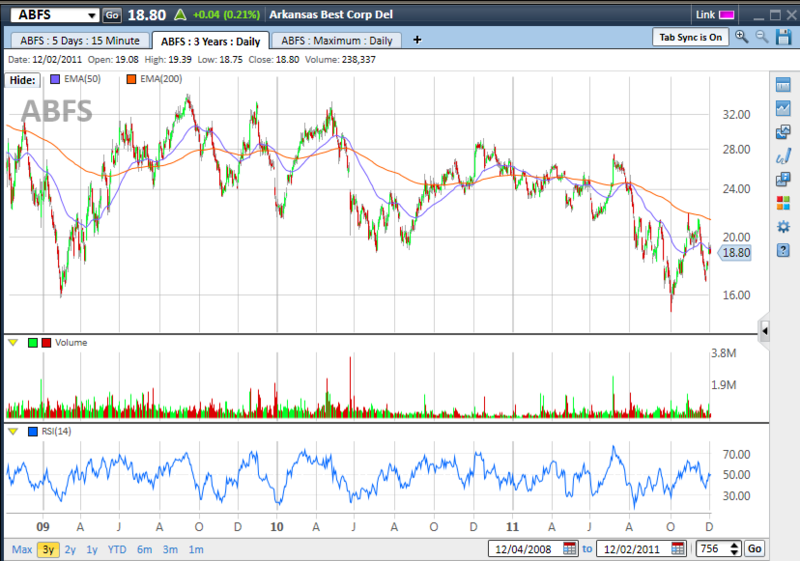 ABFS, like MWW, trades under book value (0.98x) and less than 14x prospective earnings. It is net cash positive and generates solid free cash flow. It also pays a small dividend. Friday, ABFS closed at $18.80. The DEC put we’re interested in has a strike price of $15. This is just above the 52-wk low of $14.22 which occured on October 4. With almost 21% DSP and an annualized ROIC in excess of 17% this trade too appears to have a reasonable risk/return ratio. Well, that’s all I have for you this week. Best of luck to everyone. This week we have 56 new trades which meet our selection criteria. Of these I found 2 that are worthy of further due-diligence. They are Agilent (A) and Foster Wheeler (FWLT). Let’s first look at Agilent. Agilent Technologies, Inc. provides bio-analytical and electronic measurement solutions to the communications, electronics, life sciences, and chemical analysis industries in the United States and internationally. It was founded in 1999 and is headquartered in Santa Clara, California. Agilent has strong fundamentals. It trades at less than 12x historical earnings and 10x prospective earnings. It has an net profit margin of 15% and a ROE of 26.8%. Agilent also has a net cash position of $1.35B. Now let’s look at the 3-yr price chart. Our trade is at the $29 strike price. As you can see this is below recent support at around $30. The $29 strike has a premium of $0.48 giving us a ROIC of 1.66% with DSP 15.7%. I see two negatives with this trade. First, A doesn’t pay a dividend. With the volatility in this market I would prefer to stick with stocks that pay a dividend. Second, if A were to fall below it’s recent support at $30 it could fall much further. As you can see the 3-yr low is down around $12. 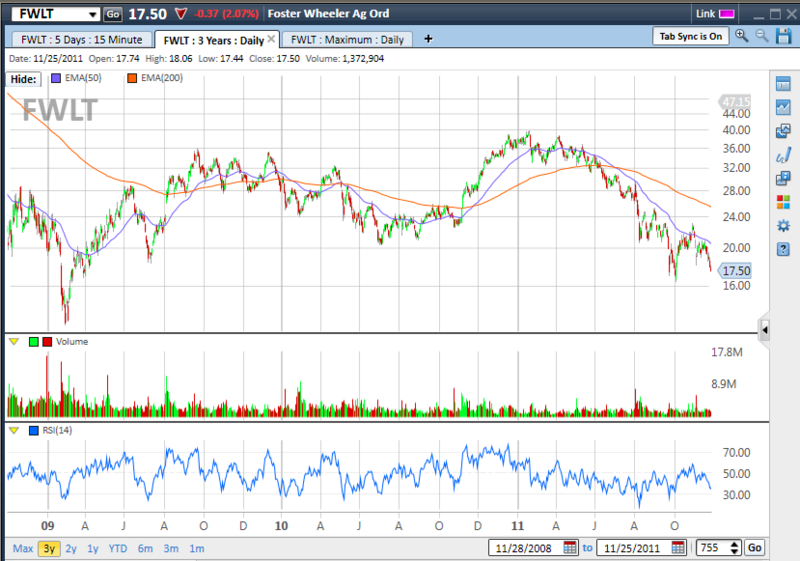 Next up let’s look at Foster Wheeler (FWLT). This is not the first time it has met our screening criteria and been selected for further analysis. You can read my previous write-up here: https://troysmoneytree.wordpress.com/2011/08/06/deep-otm-np-strategy-aug-week-2/. Foster Wheeler AG provides construction and engineering services to oil and gas, oil refining, chemical/petrochemical, pharmaceutical, environmental, power generation, and power plant operation and maintenance industries worldwide. It was founded in 1894 and is based in Geneva, Switzerland. FWLT also has strong fundamentals. It trades at just under 14x historical earnings and 10x prospective earnings. It also is sitting on a substantial pile of cash to help it through any downturns in the global economy. It’s net cash position is $6.81/share. Looking at the chart here’s what I like. First, $15 strike price is below the recent low of $16.40. Also, it is close to the 3-yr lows encountered in 2009. Our $15 put has a premium of $0.25 giving us a ROIC of 1.67%. It also has DSP of 15.7%. Like Agilent, Foster Wheeler doesn’t pay a dividend. As I mentioned earlier, that’s a negative in my mind especially in this volatile market. For those of you who would like to review the entire list of 56 possible trades you can find it here: http://finance.groups.yahoo.com/group/CoveredCalls-NakedPuts_OptionStrategies/files/. As promised I have the results of the Deep OTM NP Strategy for the NOV expiration period. During the NOV trading period the selection criteria presented us with 424 possible trades. Executing all 424 of these trades using the capital allocation rules provided here: https://troysmoneytree.wordpress.com/trading-plan/ would have required a total of $3,246,250. This would have generated premiums, net of commissions, totalling $63,630.70. This gives us a gross premium ROIC of 1.96% or 26.5% annualized. However, this trading period we also experienced a fair number of trades that finished ITM, 38 to be exact. Subtracting 38 from 424 gives us a ‘win’ percentage of 91.04%. Capital losses (assuming all positions were held to expiration) would have been $29,780.70. This gives us a net return of $33,850.00. This equates to a 1.04% ROIC (14.1% annualized). November results trailed slightly behind those recorded in September and October. However, they were far better than the dismal results the strategy returned in August. During the November trading period I highlighted 11 trades as being ones that I thought were particularly appealing. 10 of the 11 finished OTM giving me a success rate of 90.9%; almost exactly the same as the overall strategy. Maybe I should hire a monkey to throw darts at the selections (ha ha)! There are 186 selections which meet our Week 4 criteria (> 17.5% DSP, PF > 2.0). Of these I found two, Coinstar (CSTR) and Radioshack (RSH) that might be worth a deeper look. You can see the entire list here: http://finance.groups.yahoo.com/group/CoveredCalls-NakedPuts_OptionStrategies/files/. Let’s take a look at Coinstar. Coinstar provides automated retail solutions primarily in the United States, Canada, Puerto Rico, the United Kingdom, and Ireland. The company’s core automated retail businesses include the redbox self-service DVD rental; and Coinstar self-service coin-counting brands. The company was founded in 1991 and is headquartered in Bellevue, Washington. Coinstar has decent fundamentals. It trades at 11.2x forecasted earnings, has a 12% operating margin, and generates an impressive 22.5% ROE. The company carries about $123M in net debt but this is easily covered by the $229 in free cash flow. 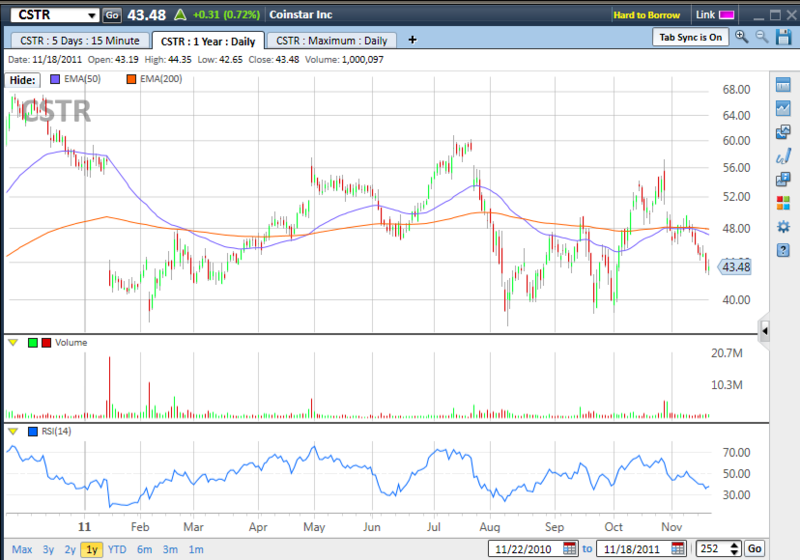 What caught my eye about this trade is the solid line of support CSTR has around the $40 mark. The put option we’re interested in has a strike price of $35. Now there are no guarantees CSTR can stay above $40 the next time it gets down there but historical results are in our favor. 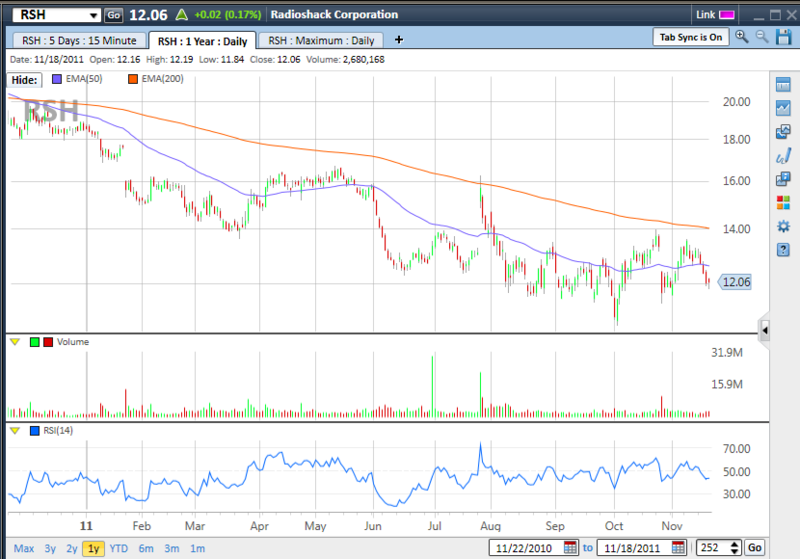 Next up let’s look at Radioshack (RSH). RadioShack Corporation engages in the retail sale of consumer electronic goods and services through its RadioShack store chain and kiosk operations. RadioShack Corporation was founded in 1899 and is based in Fort Worth, Texas. Did you catch that? Radioshack existed long before electronics were even invented! That tells me they know how to reinvent themselves as their primary market evolves over time. Like CSTR, RSH has decent fundamentals. It trades at 8.6x forecasted earnings and 1.5x book value. It has an almost equal amount of cash and debt and generates strong free cash flow. So much so that it recently announced that it was doubling its annual dividend to $0.50. At the same time it also announced a $200M stock buy-back. I like this trade because our chosen strike price of $10 is below the 52-wk low of $10.68. I also like it because at that price I would own a company that’s been around for over 100 years and it would pay me a 5% dividend yield. Well, there you have it. That’s all I’ve got time for this weekend. I’ll be back later this week to let you know how are November results turned out for the Deep OTM NP Strategy. Below are the selections which meet the criteria for Week 1 of our Deep OTM NP Strategy. For newer readers and others who may have forgotten let me remind you that our Week 1 criteria is simply NPs with at least 10% down side protection (DSP) and a Put Factor (PF) of at least 2.0 or higher. As you can see, as is usually the case this late in the monthly expiration calendar, it is pretty slim pickings. So much so that I couldn’t find a single one that I would be comfortable owning. What held me back from highlighting any of these as a possible trade is the fact that all of them except SIRI all report earnings this week. If I had to choose at least one I think I would go with NTAP. Networking stocks have done relatively well in the 3rd quarter. Thus, odds would be in our favor that NTAP will at least match earnings expectations. Also, NTAP has the strongest balance sheet of the stocks on our list. It has a net cash position (cash net of debt) of $9.36 / share. Well, that’s all I have to report for this week. Best of luck to everone in the final week before expiration. Below is the list of selections meeting our Week 2 criteria. As you can see the list is fairly short, containing only 17 entries. As you can see I only found two that I feel are worthy of your further consideration. Before I tell you any more about either of them I must warn you that both are scheduled to release 3rd quarter earnings in the coming week. First up let’s look at Autodesk (ADSK). Autodesk, Inc. provides design software and service solutions to customers in architecture, engineering, and construction; manufacturing; and digital media and entertainment industries. It operates in four segments: Platform Solutions and Emerging Business (PSEB); Architecture, Engineering, and Construction (AEC); Manufacturing (MFG); and Media and Entertainment (M&E). It was founded in 1982 and is headquartered in San Rafael, California. ADSK has an excellent balance sheet. It has over $1.37B in cash (over $6/share) and ZERO debt. 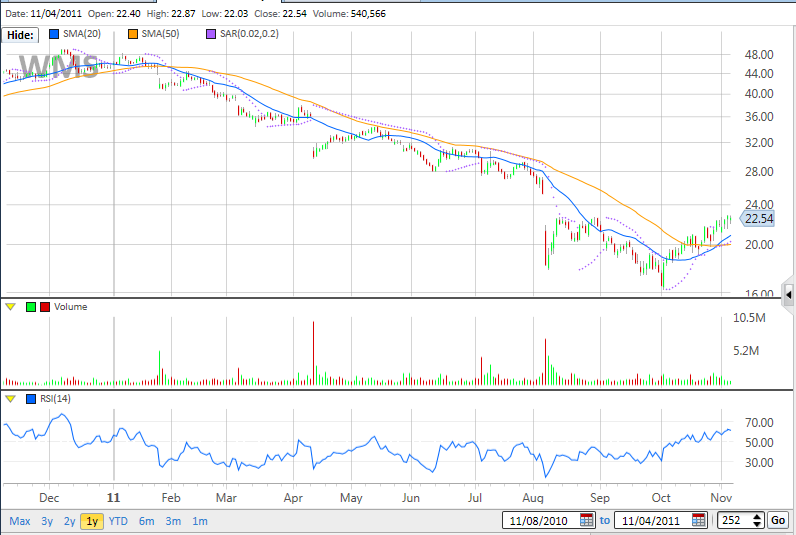 As you can see in the below chart ADSK fell over the summer, bottoming out in mid August at around $24. Since then it has recovered, steadily increasing to it Friday closing price of $35.02 Our selected trade is at the $31 strike price giving us 12.68% DSP. The $0.42 premium gives a 1.35% ROIC. and is headquartered in Waukegan, Illinois. WMS like ADSK has an excellent balance sheet. It has $90M in cash with ZERO debt. 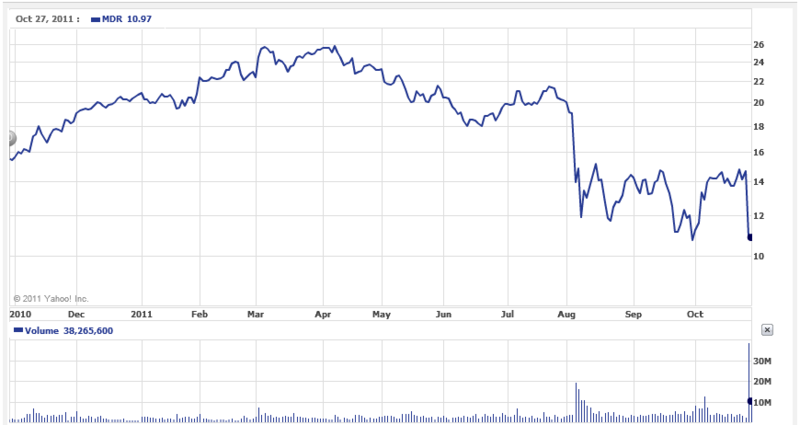 WMS has been falling all year long. It finally appears to have found a bottom on October 3rd when it closed at $16.53. In the past month it as risen steadily closing Friday at $22.54. Our selected trade is at the $20 strike price giving us 13.04% DSP. The $0.40 premium gives a 2.00% ROIC. Well, that’s it for this week. Please remember what I said earlier. Both ADSK and WMS report earnings this week. If either misses expectations they could fall significantly. The big move up this past week significantly reduced the number of opportunities from which to select our trades. After filtering out stocks selected last week, and the usual biotechs and small cap Chinese stocks we were left with 21 possibilities. From these I found two that I would like to highlight for you today. producing, gathering, processing, and transporting natural gas primarily in the United States. I did a ‘double take’ when I first came across this possible trade. It seemed too good to be true. Friday, the stock closed at $31.25. It has risen sharply over the past month, having been as low as $23.35 when the market bottomed out on October 3rd. The strike price selected is $20. That’s why I did the ‘double take’. It isn’t often you are presented with the opportunity to earn 0.75% ROIC on a trade with 3 weeks remaining to expiration and 36.48% DSP. However, bells from the school of hard-knocks also began ringing. Mr. Market very rarely misprices options. For the premium to be this high there must be a significant amount of perceived risk that WMB could fall substantially in the next three weeks. However, I found nothing ominous lurking in recent news headlines. WMB will announce earnings between now and expiration so that could explain part of the premium but it doesn’t seem like it could or should account for all of it. The $20 strike price is below the 52-wk low of $20.91. 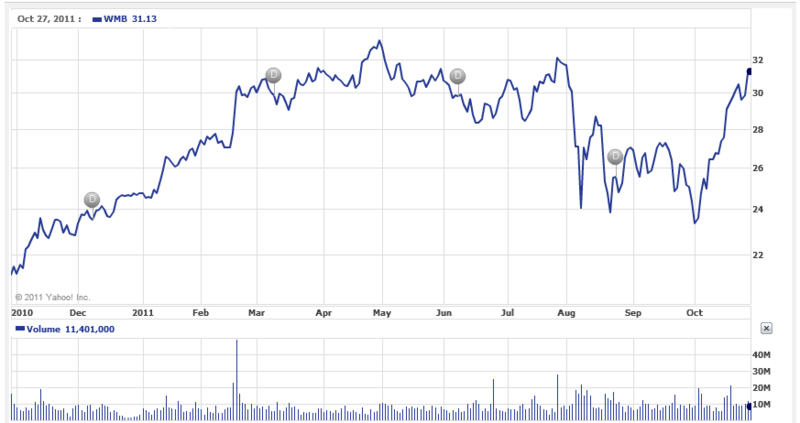 As you can see in the 1-year chart presented below, WMB hasn’t been down around $20 in quite a while. The 5-year chart is a little more illuminating. With it you can see WMB has been much lower than $20 in the past 5 years. However, it also shows WMB is a consistent payer of steadily rising dividends. That is the primary reason I like this trade. Over the past 5 years they have more than doubled their quarterly dividend payout from $0.09 to $0.20. Thus, I can confidently enter this trade knowing that if the stock takes a tumble and I have WMB put to me at $20 I will have acquired a good stock to hold in my portfolio should I so choose. Having the stock put to me at $20 would give me a current dividend yield of 4% and an opportunity to participate in continued growth of that dividend. 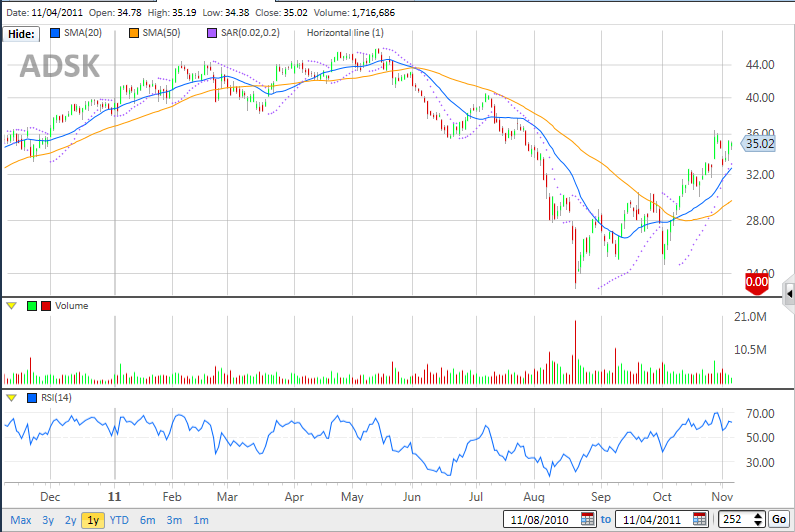 My second selection this week is McDermott International (MDR). McDermott International, Inc. operates as an engineering, procurement, construction, and installation company worldwide. The company focuses on designing and executing complex offshore oil and gas projects. Before I proceed any further I want to make clear that I consider MDR a speculative trade. It is not one I would want to hold long-term as it does not pay a dividend. However, I think there is a good opportunity to generate some extra cash flow with this trade. MDR pre-announced a 3rd quarter earnings shortfall last week. Mr. Market, not liking surprises, responded accordingly driving the stock down sharply. Having closed at $14.63 on Wednesday it fell to as low as $9.34 intra-day on Thursday before bouncing back a little and closing at $10.97. Friday, it closed at $10.86. Their were two primary issues discussed during the company’s conference call. One centered around unexpected one-time issues on existing projects that drove up the expenses incurred on those projects during the quarter. The second issue discussed was the anticipated compression of 2012 margins. Management indicated they thought this issue would be resolved heading into 2013. 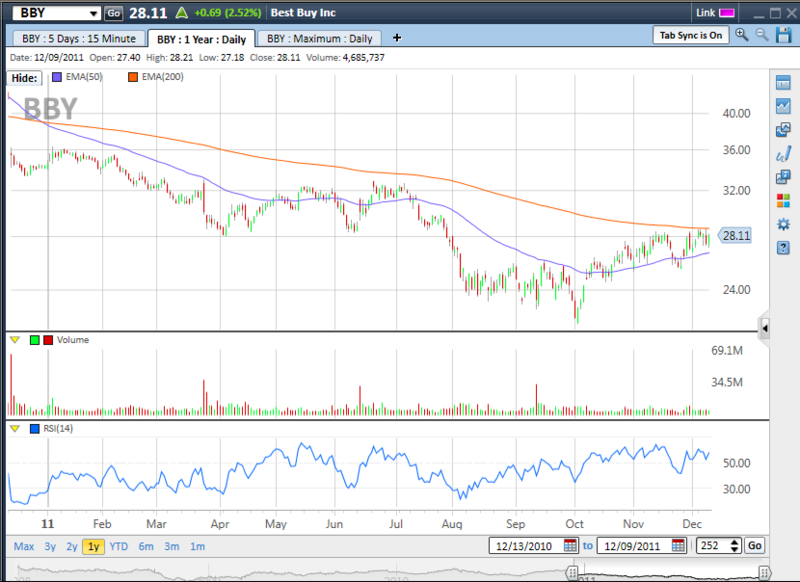 Looking at the 1-year chart will show why I like MDR as a speculative trade. Now that the bad news is out I think MDR will languish down here around $10-$11 for awhile. Should we get the much discussed year end market rally it might even creep back up over time. While you can’t see it in the above chart, which only shows closing prices, MDR actually went as low as $9.34 on Thursday but reclaimed over $1.50 from that low to close at $10.97. To me that means Mr. Market realized it had over reacted and rebounded accordingly. People, hearing the bad news, ran for the exits without really considering the longer term impact of what was being said. All of this selling pressure pushed the stock down further than it should have gone. Once the initial selling panic was over cooler minds prevailed and stepped in to buy the stock at very dressed prices. As buyers reentered the market the price recovered. Thus, I think a bottom is in and it is above our strike price of $9. At $0.15 bid on the $9 put our ROIC is a robust 1.67% with 3 weeks to expiration and 18.51% of DSP. Well, that’s all I have for you this week. Happy Halloween to one and all. Don’t let the little ghosts and goblins spook you too much tomorrow night. There are a lot of selections for our Deep OTM NP Strategy this week. 378 of them in fact. That’s way too many for me to easily post in my blog so as I’ve done before I have posted the entire list of selections out on the Yahoo CoveredCalls-NakedPuts_OptionStrategies group board. You can find it here: http://finance.groups.yahoo.com/group/CoveredCalls-NakedPuts_OptionStrategies/files/. I have 7 trades for you to consider. They are presented below. I have to say it is hard to be excited about any of the trades I selected. Here’s why…the market has rallied significantly over the past several trading days. This has occurred despite the tremendous overhang of the European debt crisis and being in the middle of earnings season. Thus, I feel a correction could be right around the corner. On the other hand you have a lot of analysts saying we’re going to have a year-end rally. So bottom line, nobody knows what is going to happen. Thus, given all this uncertainty I remain skeptical and very cautious. There are two stocks in this list that I’d like to highlight. They are Dow Chemical (DOW) and Freeport McMoran Copper & Gold (FCX). I’m highlighting these two because they are highly sensitive to the economic cycle. If the worldwide economy continues to slow these stocks will continue to fall. If the economy stabilizes I believe both these stocks are worth a look. Let’s look at the 5-yr charts for DOW and FCX. As you can see both of these stocks have remarkably similar charts. Both fell into the single digits during the financial crisis in late 2008 and early 2009 only to soar 400-500% as the market recovered. Both are bouncing after recently hitting 52-wk lows. The strike prices for each of the trades on these stocks are at or below those recent lows. In the case of DOW, the $22 strike price is near the recent low of $21.51. For FCX the $29.50 strike price is below the recent low of $29.87. Well, that’s it for this week. Best of luck as we start this next trading cycle.